Channeling power through simplicity can be a hazardous affair. For example, Gary Numan’s 1979 effort The Pleasure Principle, aside from the pop aesthetics found on the track Cars, aptly demonstrated that a strong rhythm section, coupled with layers of buzzed and washed synthesisers and a hypnotic vocal, could indeed make an impression. Unfortunately, this type of music was dismissed by the popular press and an ever-fickle listening audience. Fortunately, Numan persevered, securing a solid fanbase (known at the time as ‘Numanoids’) and forging darker albums, some of which influenced the advent of genres such as techno-dance and darkwave. This same power can be found on many of the tracks on Fear Of Eternity’s official debut effort, Toward The Castle. Interestingly, this release has already garnered some critical backlash, particularly from narrow-minded black metal reviewers and listeners, and indeed some the criticism is worthy, for Toward The Castle is not without flaws. 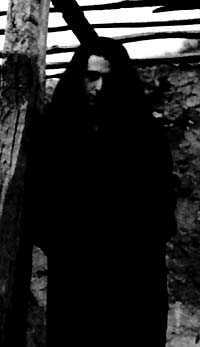 However, for a debut album, the overall approach, that of black ambient, pushes the boundaries of the genre, manifesting influences that range from the likes of Emperor and Burzum (think Hlidskjalf) to the early synthesiser excesses of Mortiis and modern players such as Neptune Towers and the mighty Gorepriest. Hailing from Italy, Fear Of Eternity consists of a singular member who plays all the instruments: Andrea Tilenni. Tilenni played drums with Sonoath, an Italian death/ black hybrid that relied heavily on keyboards (Tilenni played on only one release, Research). One cannot mention Italy and dark ambiance without referring to Goblin. Originally known as Origin, Goblin played progressive rock (influenced by King Crimson) and even funk before finding a niche is creating rollicking and eerie soundscapes for Dario Argento films such as Profondo Roso and Suspiria. The Goblin influence dominates much of Toward The Castle, as do soundtracks from the likes of Phantasm (released the same year as Suspiria) and Carpenter’s Halloween (with its dominant synthesiser sting). Toward The Castle begins with a short instrumental titled Departure, which is followed by Flying Over The Mountains. It is on this first proper track that most listeners will realise that Fear Of Eternity has cast aside most black metal conventions and instead embraces black ambiance. But even the black ambiance boundary is pushed, as this one-man band uses minimalism to craft its eerie soundscapes. The overall effect on Flying Over The Mountains is fantastic, as buzzsaw key riffs mix with guitar pedals and guitars while soft-cell drums mesh with a raspy, demon-styled vocal hiss. The title track continues in a similar vein, the approach bordering repetition, but the end result will leave the listener satisfied. The next two tracks, Fear Of Eternity and the title track, undergo a bit of a metamorphosis, as the guitars become clearer – which is not saying much, as they still resonate like a wasp trapped in a jar – and the keyboards create an air of despondence. Melancholy Rain begins to strain under the approach described in this review, principally because the rudimentary structure is so rigid in its repetitive execution that the music becomes a bit bogged down. The same could be said of Crying, except that the vocals here are varied and thus signal several essential stings. The Valley Of Sadnessskirts the boundaries of minimalism, as does the closer, Illusion Of Purity, and most listeners may find it difficult to actually pay attention. So, what exactly makes this release a black metal one? First and foremost, it’s the approach. Fear Of Eternity capitalises on the fact that there are more tributaries that lead to evil than the heavily trodden paths of anger, hate, and violence. Fear Of Eternity walks paths laden with despondence, desperation, and fear. There’s the misery of guilt, the gooseflesh of trepidation, and the anxiety of the unknown. And second, the vestiges of the approach forged by Mayhem/ Darkthrone et al. remain, from the chainsaw guitars to the raspy vocals. Toward The Castle will not impress most fans of the inner and outer circles, but fans of black ambiance, gothic, and those willing to take a chance on a new type of ‘extreme music’ should give it a listen. It’s not perfect, but it is a beginning.